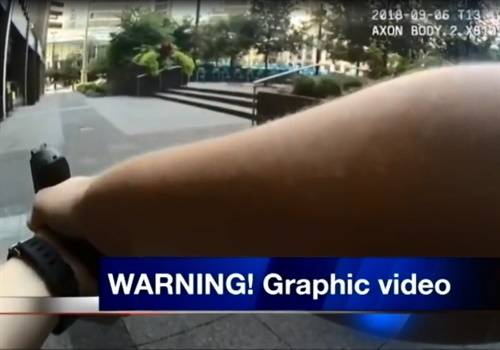 VIDEO: Cincinnati Police Respond to Active Shooter in Bank Lobby"
The Cincinnati (OH) Police Department has released body-worn camera footage of four officers responding to an active shooter in a bank lobby last week. The officers—identified as Officer Jennifer Chilton, Officer Antonio Etter, Officer Eric Kaminsky, and Police Specialist Greg Toyeas—were responding to 911 calls saying that a man had opened fire on people at the Fifth Third Bank Center lobby on Fountain Square. Arriving just minutes after the incident began, the officers rapidly approached the sound of the gunfire, finding the shooter and neutralizing the threat. Cincinnati Mayor John Cranley said, "The heroism of these officers is truly remarkable. You can see in the video...the guy shooting at the cops, and them not being afraid and engaging to end it," according to WHIO-TV.